I'm leaving bright and early tomorrow morning for the North Country, and so had to go greet the ocean this morning as I'll miss it while I'm home for Christmas. The waves are huge and it's like fireworks watching them, oohing and aahing at the majesty. I do the same thing when it's snowing, so I'm good most anywhere, but they're both their own kind of special. 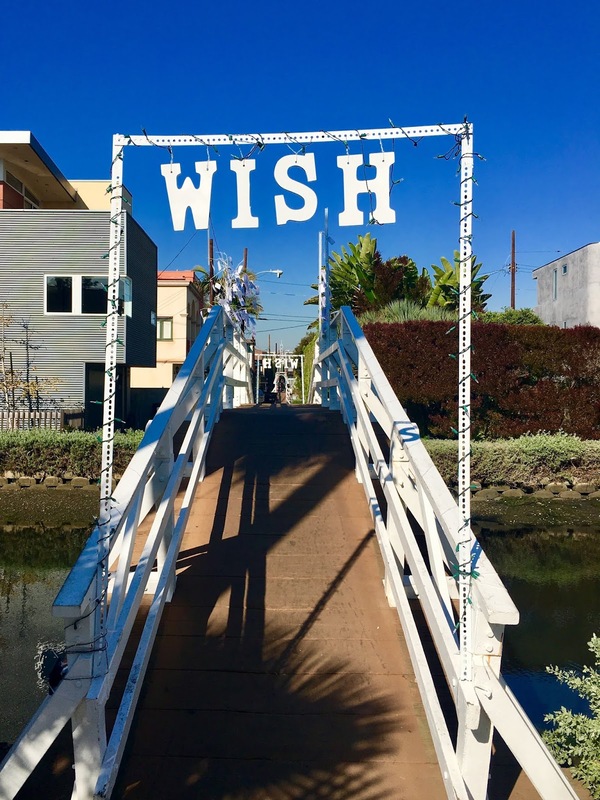 On the way back to get packing, I cut through the canals and crossed the "Wish" bridge, as it had been too dark to really read the wishes on the night of the canal parade. 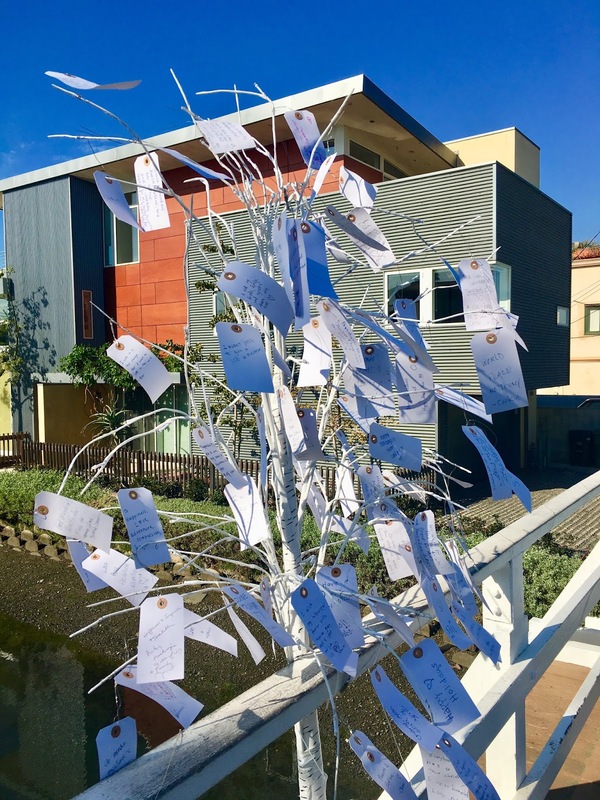 The idea of putting your best wishes out there to flutter in the wind, in the hopes of them being granted ... I find it lovely. 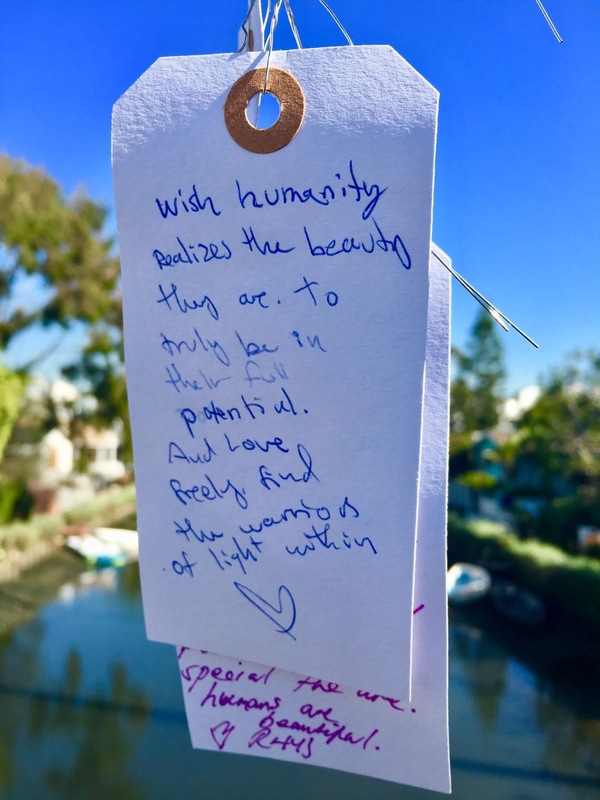 The majority of the hand written wishes were big ideas, like for the world, not the individual and that was nice to see. I'm a big fan of adventures and memories over stuff, so wishing for material things hasn't been my thing for a long time - not when we live in the world we do. Wishes need to be bigger and better ... for the whole humanity picture at this point. That's why I zeroed in on the wish below ... that "Humanity would realize the beauty they are ... to truly be in their full potential ... to love freely ... to find the warrior of light within." Man. I couldn't have wished any better myself. Times have gotten so mean and snarky and selfish and greedy ... that it brings you to tears when someone posts a video of someone else doing some sweet, little thing that should just be automatic. We all have it in us to be kind, to be humane ... to be giving of ourselves. There's no material thing out there that can give you the same feeling of kindness without expectation, and knowing that you made someone else feel happier, even if just for a moment. To me, that's what this season is all about. I bet if we all wish for these things together, it will just BE. I read a great quote from Paul Klee this morning on my word a day page, and it said, "Art should be like a holiday: something to give a (wo)man the opportunity to see things differently, and to change (her) his point of view." Yes. Let us take this opportunity of this beautiful holiday to see things in a new, more humane way, not to just change our point of view, but to change this world. It can be done. With love. So, I WISH you all a wonderful holiday! I'm going on hiatus for Christmas break back home, but I can't wait to share all of the good stories that are coming in our new year ... in our new world that we wished for. Christmas love to all! After the depressing sight of seeing a Starbucks open for business on our Venice Boardwalk, I needed a boost in my awful, disappointed mood. I got it when a few yards away I saw that some of the people that live on the beach had decorated the umbrella things for Christmas, with a sign that said "Christmas in Dogtown". I loved that, because it shows that the Christmas spirit is felt by everyone, and also serves as a reminder of just exactly where we are. A place that has always moved to the beat of its own drum (circle). A place that is storied for it's artists, musicians, skaters, surfers, writers, and all of those unafraid to let their freak flags fly. 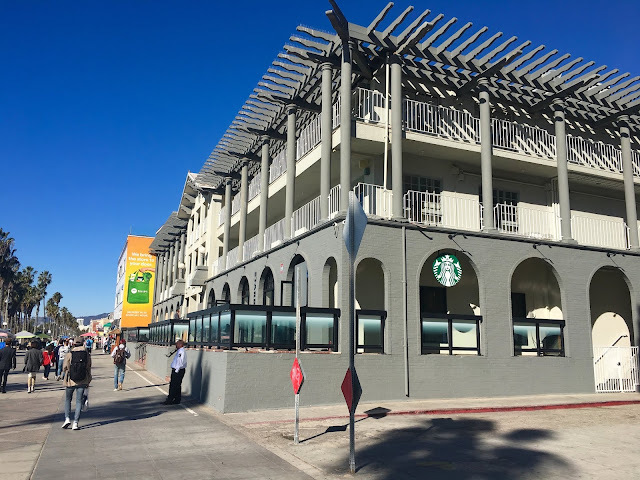 Not a place that wants or needs a corporate chain like the ultimate slap in the face to Venice that a Starbucks on the Boardwalk is. Not a place that would support a Ben & Jerry's moving in RIGHT next door to Charly Temmel's. How insensitive and disrespectful to a long time Mom and Pop business can you be? 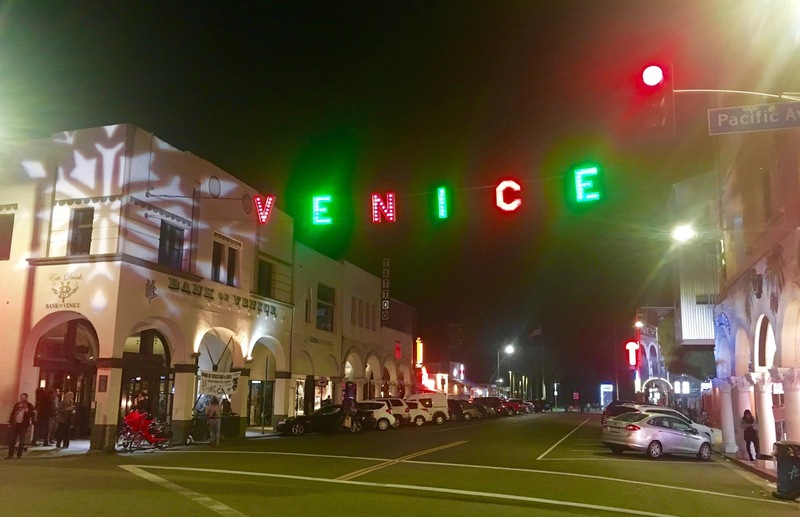 No one that cares about Venice should be supporting ANY chain store within the city limits. People will argue their "change is inevitable" points, and I really don't care to hear them. 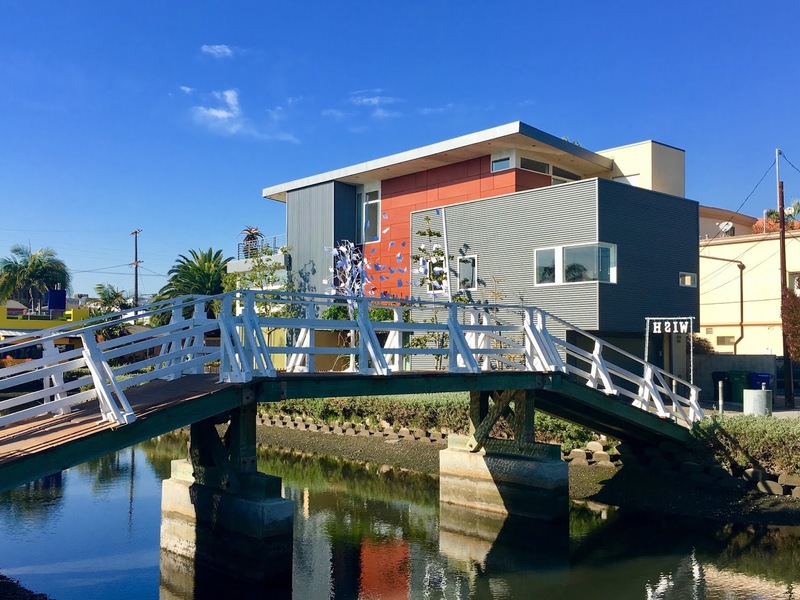 People know in their hearts that this is wrong, and that Venice is Dogtown - and should be allowed to be one of the few originals left on this planet full of greed and corporate interests. We don't want to be like everyone else. That's why we're here. But for how long if places like this are allowed to ruin all local character? To run out all the local businesses? To make this legend of a place become just another anonymous mall in America. Gross. Please think about it all - as well as your part in it - as we prepare to celebrate Christmas in Dogtown. BLASPHEMY! Starbucks Opens On The Venice Boardwalk. 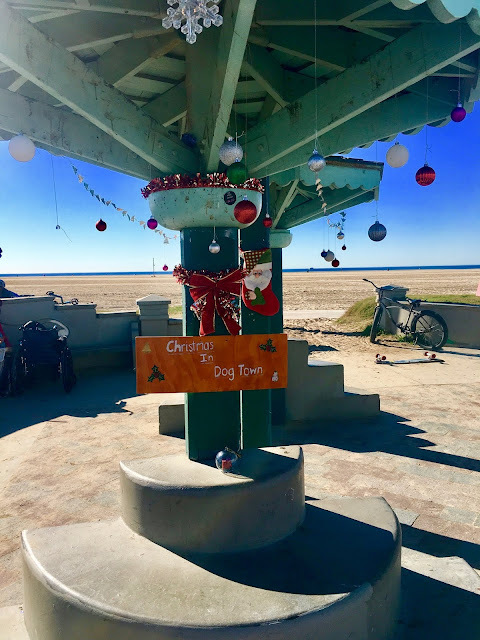 It's an absolutely beautiful perfect day in Venice, 76 and sunny, everyone looking and feeling great as I cruised down the Boardwalk on my morning visit to the ocean. 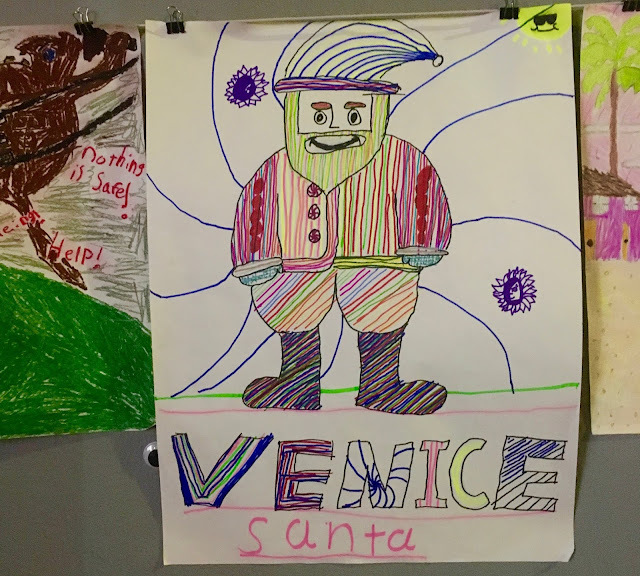 There have long been rumors that a Starbucks was going to take over the space vacated by the Venice Freak Show, but no one ever thought it could really happen - not here in Venice, one of the most unique places in the world that actively shuns corporate interests and homogenization. But it has. 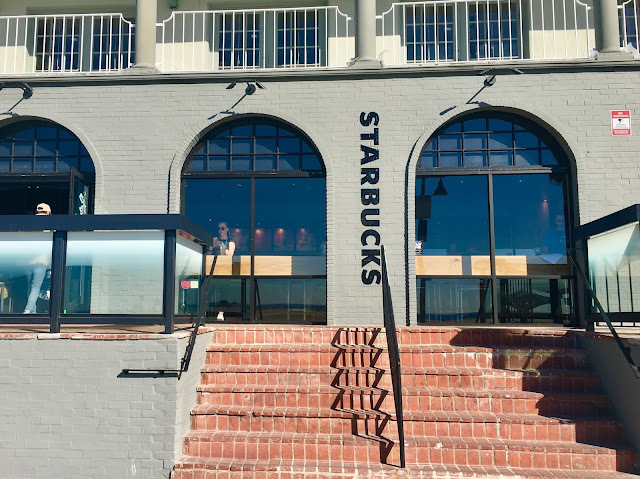 The doors are now open for business at Starbucks (THE symbol of gentrification) in the Freak Show space, in what is the biggest possible slap in the face to a community perhaps ever. Anyone who thought this was a good idea is sadly out of touch with reality. The business that was the MOST perfect Venice Boardwalk attraction possible has been replaced by the LEAST likely place to ever be welcome in this town ... and people are upset. I'm upset. WHO thought this would go over well? I believe Snapchat is still the landlord of the building, so we'll continue to despise them and wish their stock to fall ever lower in a karmic comeuppance that is celebrated by Venetians every time we hear of a new low. Whenever I see someone grown putting one of Snap's stupid filters on their face, I lose a little respect. Seriously. But, STARBUCKS?! On the BOARDWALK?! This is war. There was a security guard (what coffee shop needs a guard? They know we don't want them.) holding court outside the place (as I'd NEVER step a foot inside), and I asked if it was open. He replied that it was, and I nearly cried. I told him this was outrageous and to please tell his employer that we don't want them here and they are not ever going to be welcome. I know some misguided people like their Starbucks coffee, but if I ever see anyone from Venice going into this location, there's going to be words. 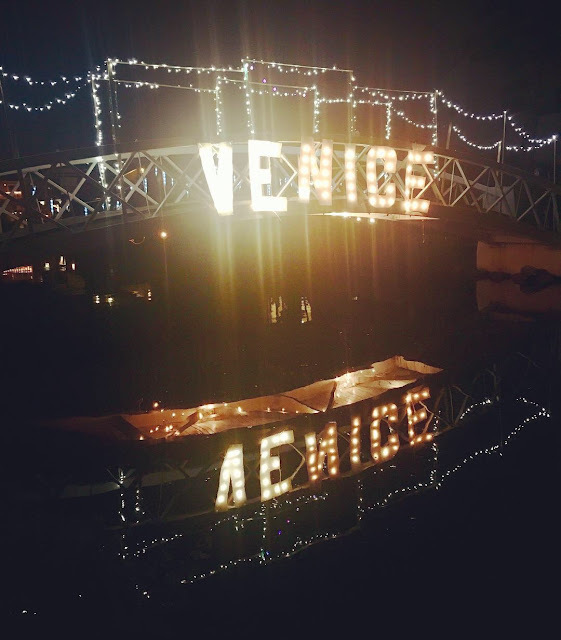 If you must have that swill, there are plenty of other locations that don't spit in the face of Venice. A Starbucks on the Boardwalk was always a joke, like yeah right, that could never happen. But here it is. It's times like these that you really miss the V-13. It was quiet when I was down there, with maybe one or two tourists going in, but I'm hoping this is the calm before the storm. The storm of outraged people who love Venice and realize that this seriously puts the entire history and legacy of Venice on the endangered list - if not quite extinct yet. The storm of protests that greet this corporate behemoth every day they open their doors. The storm of a backlash so big that it puts this Starbucks location out of business before their lease is up. Starbucks just wrecked my beautiful morning, and I'm pissed. People are making signs of protest as you read, and I hope that you will give this terrible joke of a space the double middle fingers every time you pass by - until it's gone. 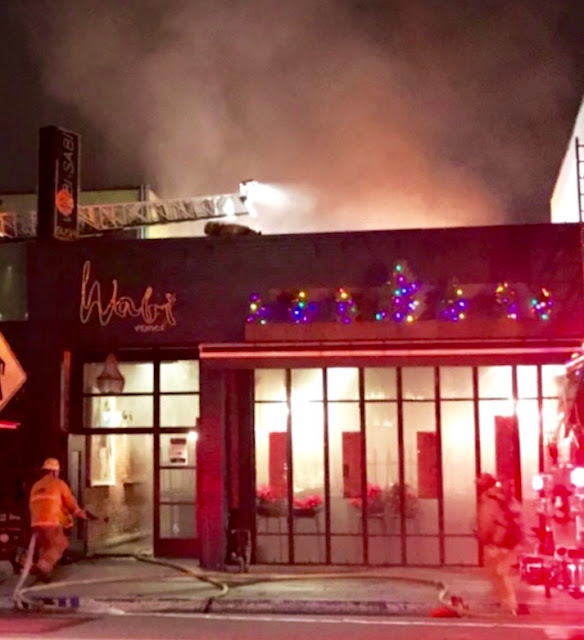 I got a text from my dear friend Troy this morning that Wabi Sabi (It's always Wabi Sabi to us) had gone up in flames early this morning. 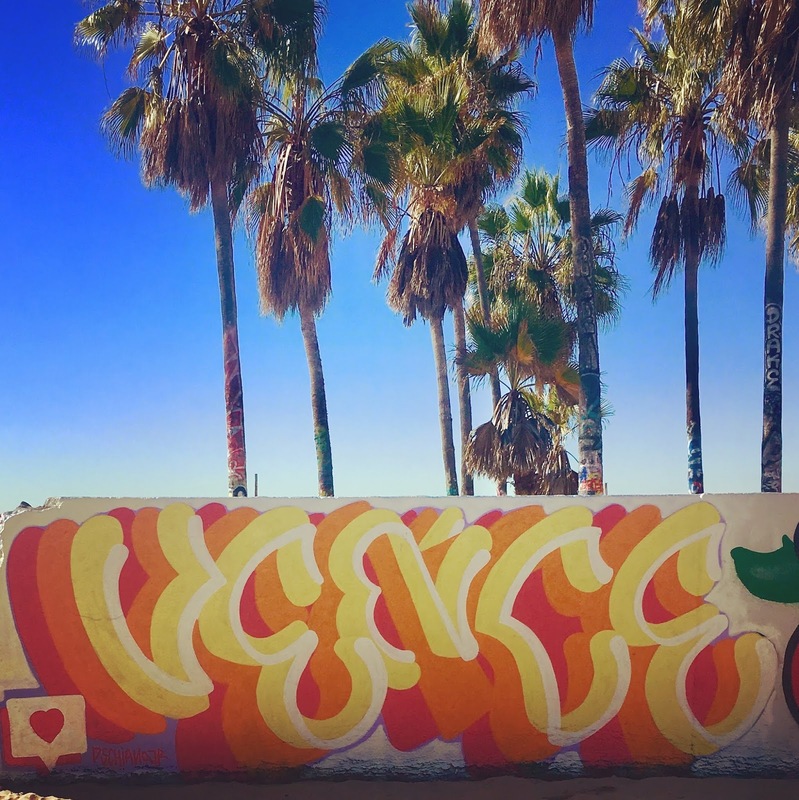 The news spread like wildfire itself, with the whole Venice community gasping and wondering what happened. The fire is suspected to have been caused by an electrical issue, and the only good thing about it is that no one was hurt and it happened when it was empty. 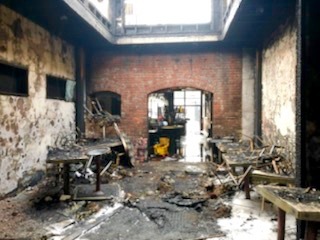 The buildings on either side (Tasting Kitchen and Gorjana) seem to be fine, and all three were probably saved by the fact that the atrium in the middle of Wabi has ventilation for the flames to go up and exit through. 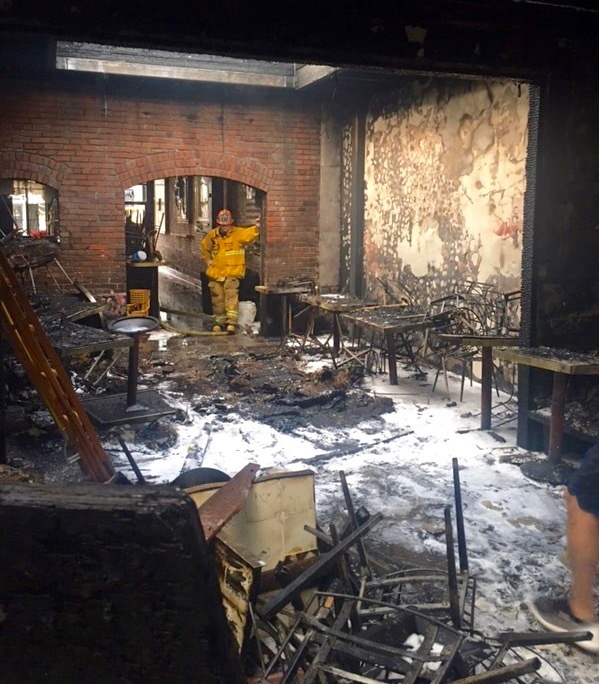 I talked to Troy and some other employees and they hear that the popular and beloved Venice eatery on Abbot Kinney will be reopened by New Year's - at least the bar part. That seems mighty optimistic based on the photos they sent me, but I'm all for optimism. The holidays always make me a little nervous about fires, with dry trees and lights and candles and drinking and all of that, but electrical fires seem like they could/should be avoided. The extra sad part about all of this is that it IS the holidays, and now there are a whole bunch of people without work. Here's hoping that insurance will pay them while the place is being rebuilt ... and/or that neighboring businesses will offer them to pick up some shifts with them, as has happened in the past in other circumstances. The hospitality industry is pretty good about looking out for each other, so I feel good about that being the case. 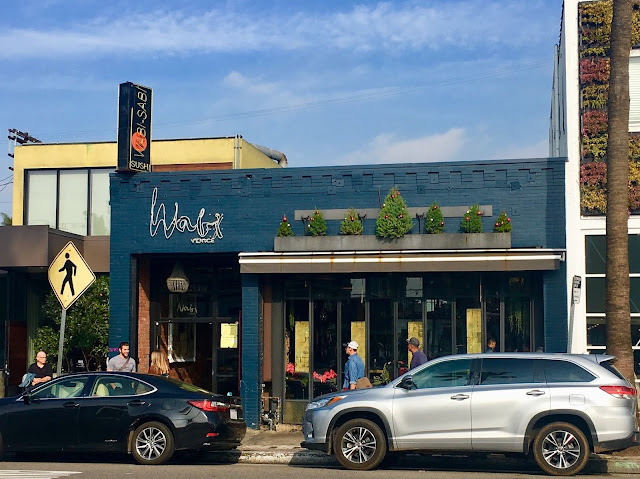 Wabi Sabi has been a neighborhood hang for a good long time now, and an excellent member of our community. They host local artists to show their work all of the time, complete with receptions for the aritst. 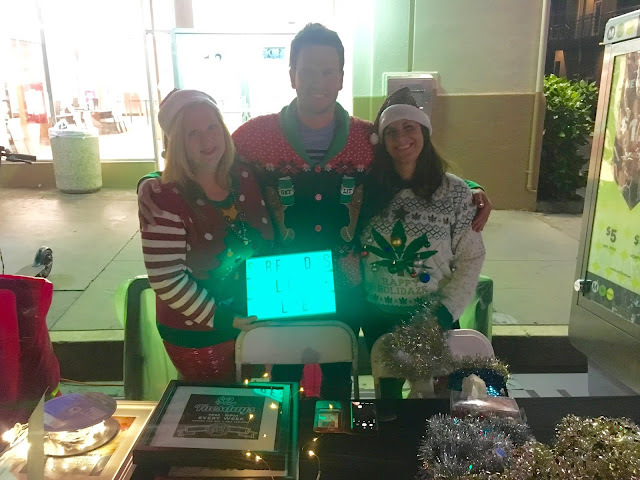 They donate to community events, and even gave a gift card for my own silent auction for our 90291: VENICE UNZIPPED documentary. It's one of the few places on Abbot Kinney that you will still see old school locals, especially after the original Hal's closed. The Wabi folks are good people, and they care. It is my hope that the community responds in kind now that Wabi could really use it. I walked by a while ago, after the flames had all been doused, and it doesn't look as bad from the outside. 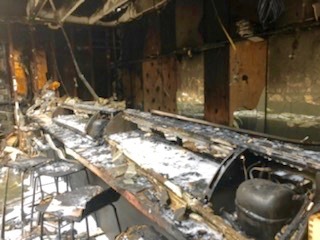 I was told that the hot kitchen is fine, and that the bar was still fairly intact, so they may be able to open that part sooner than the rest, which could just be walled off while being fixed up. I hate to think of all those beautiful plants hanging in the atrium all ablaze, but that little zone is really most likely what kept it from being far worse. Wabi Venice will rise again - and we'll all be there to support them and celebrate the Venice spirit that will not keep them down. A sad day for Wabi and those who love it ... but also yet another reminder to support and care about the people and places you love WHILE you have them. We love you, Wabi! We'll be there right when you open those doors once again. I was out walking around this morning and cut through the canals to check out the bridges in the daytime. The sun was high and warm and humming Christmas carols felt a little out of place, but it still had to be done ... 'tis the Season! 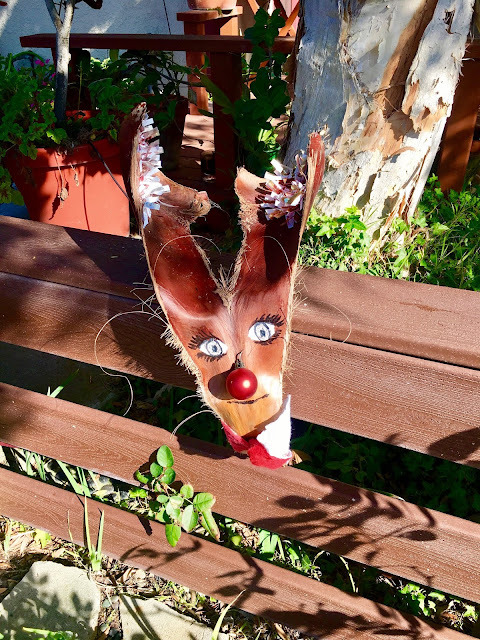 At the other side of one bridge, I saw a great and creative use of dried up palm fronds - someone had made Rudolph the Red Nosed Reindeer on a frond. Love it. ... And then there was Mr. Claus himself, in a grass rootsy display of natural Christmas decoration ingenuity. 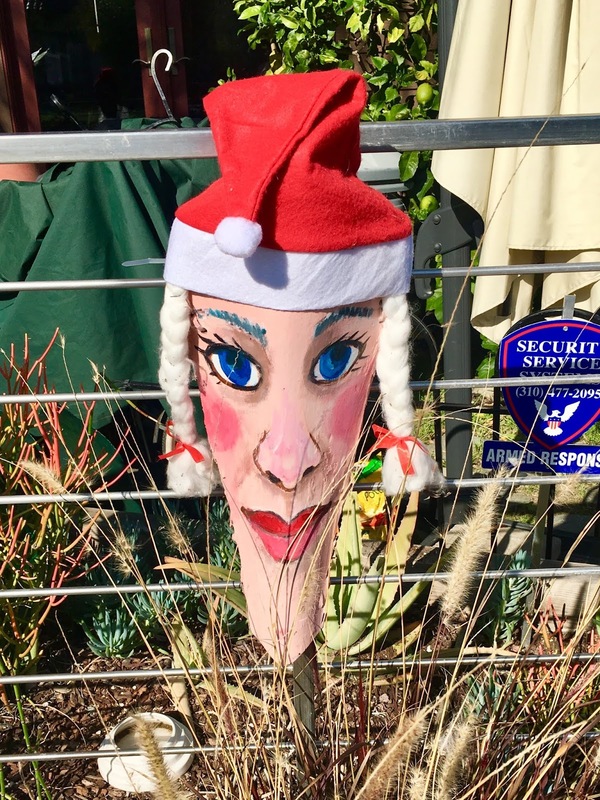 I've never seen palm tree art done like this, and it touched me as a very Venice way of showing off your holiday cheer. Good job, folks! 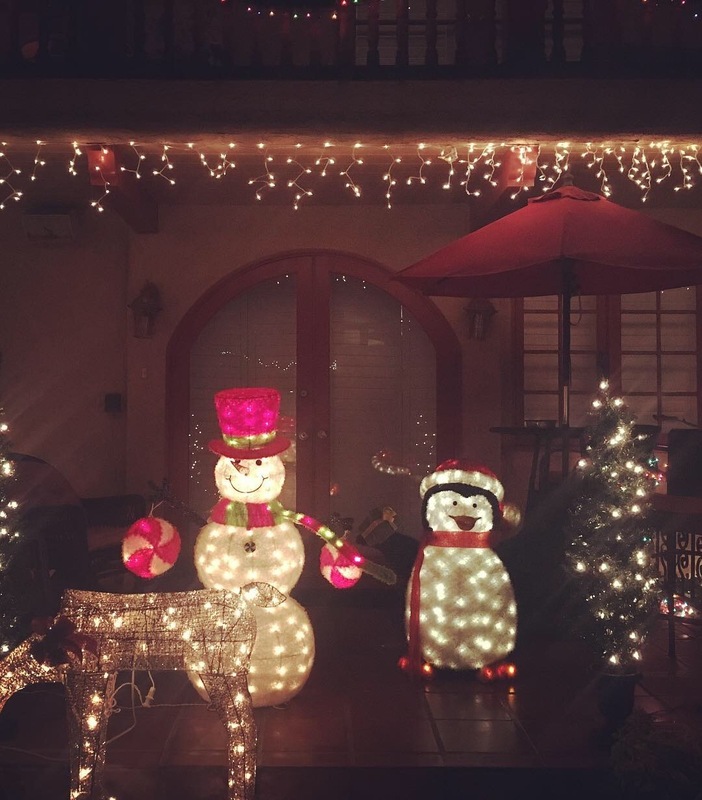 Christmas decorations make me happy (my name is really Carol for a reason), and I'd love to see which ones all of you love most ... please feel free to share them with me and I'll post for all to see. It all goes by so fast, let's love it all while we can! Sometimes it's hard to tell what time of the year it is around Venice, with the year-round lovely weather always pretty much the same, but Christmas time is different. You know. The halls of the houses get decked, Christmas lights show up everywhere, and one day a year there is even snow. 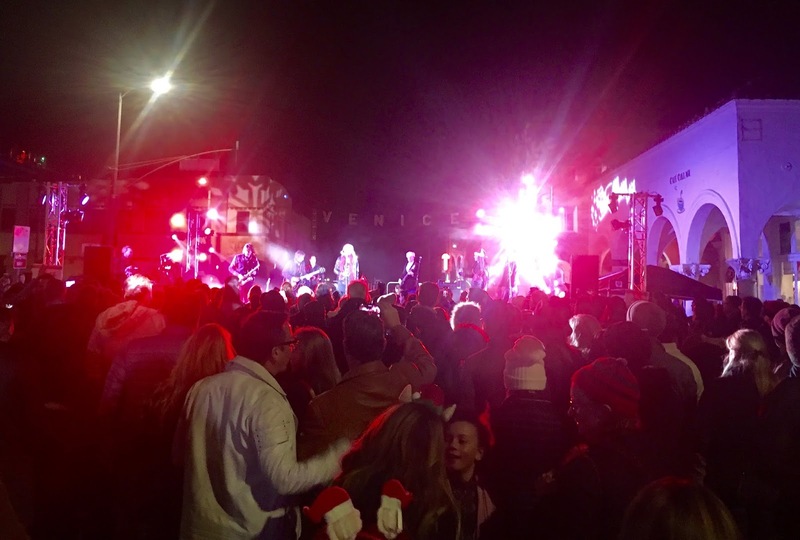 This weekend was jam-packed with holiday cheer, although the 25th Annual Venice Surfathon took place on Saturday, making it feel all summery again. It was bright, warm, and sunny as the surfers from all different categories got into the water to ride the decent waves. 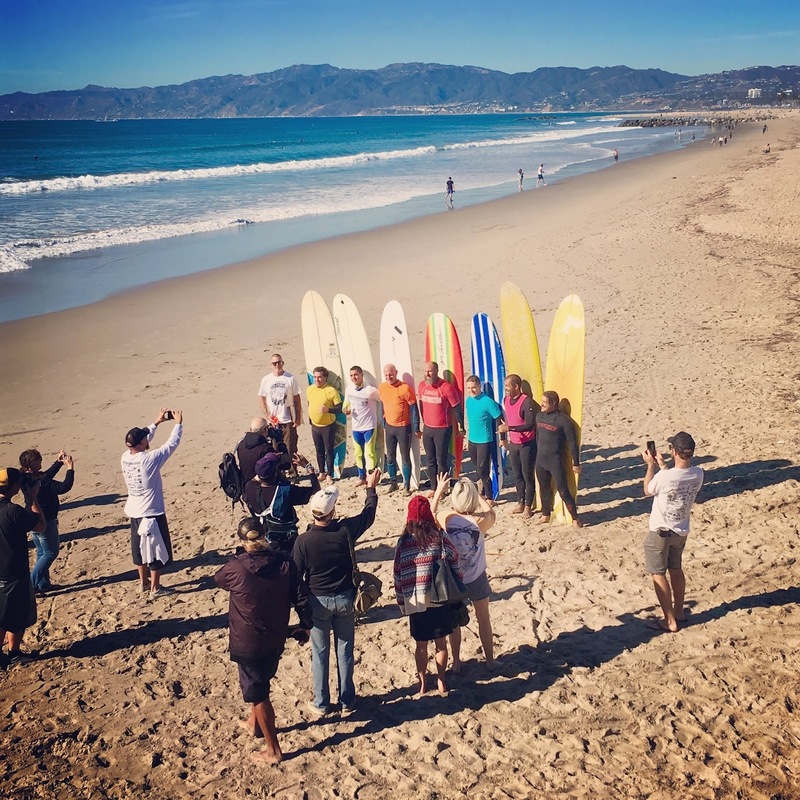 It's always good to see the surfers out there every year, as it really becomes a reunion of longtime friends. It was very California to sit on the sand watching the competition while seeing snow on the mountains in the distance. I love that. 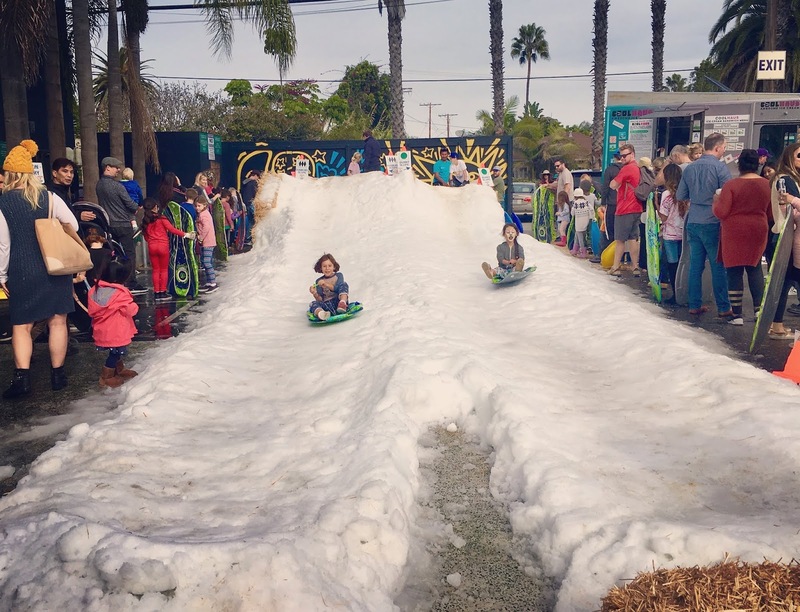 The snow day was Sunday at The Brig in the parking lot, where they truck in the snow annually to give the Venice kids a little taste of what winter is like in other places. 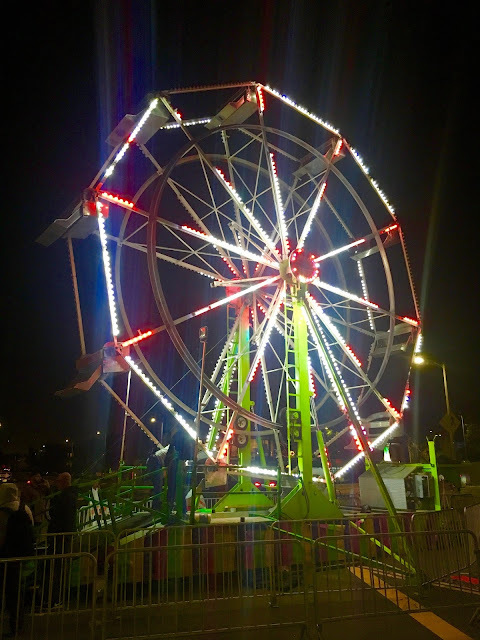 The lines to take a spin down the icy snow were long, and everyone was in a festive mood. 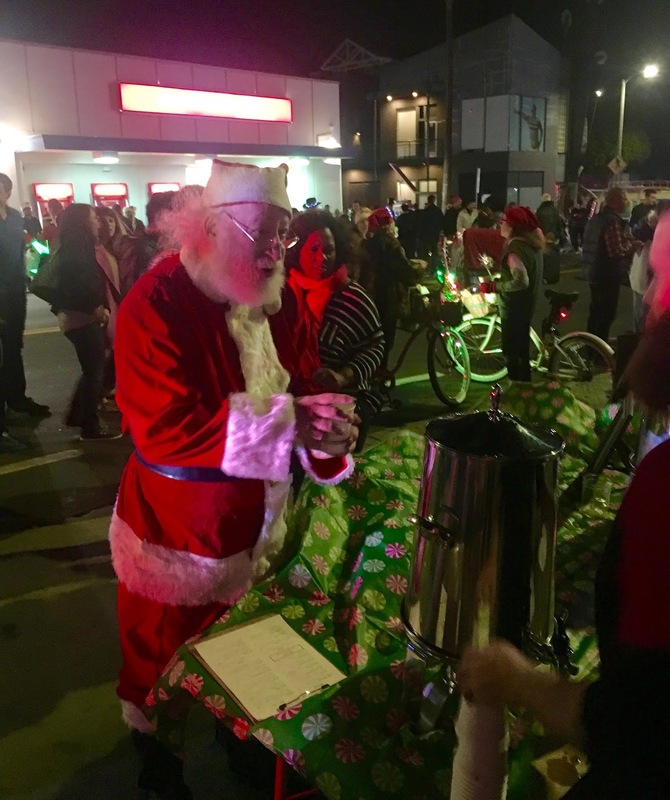 There were holiday arts and crafts, food trucks, and the chance to tell Santa Claus just how good they were this year. 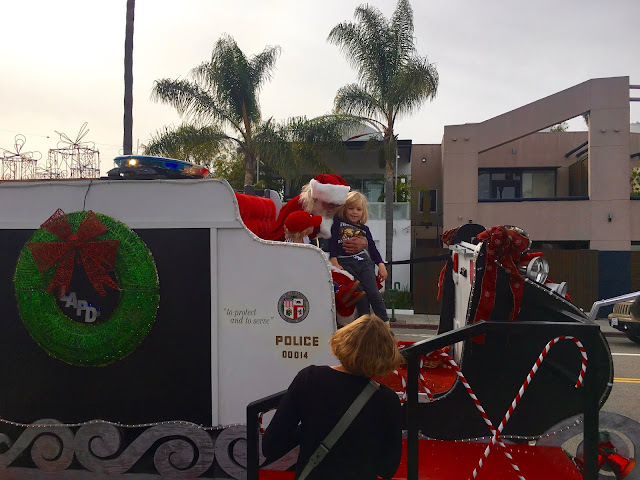 The LAPD had a police sleigh (?) parked out front, and kids lined up to be handed up to Santa in the cop sleigh, which is both cute, and kind of funny. There was a different Santa later in the day to sit on the Santa throne, which may have confused some little ones who were there long enough to catch both, but still great. I love this little snow day every year, as it's a gift to the whole community, and people love it. It shows on their faces, and lets you know that our people are still here. Thanks, Brig! 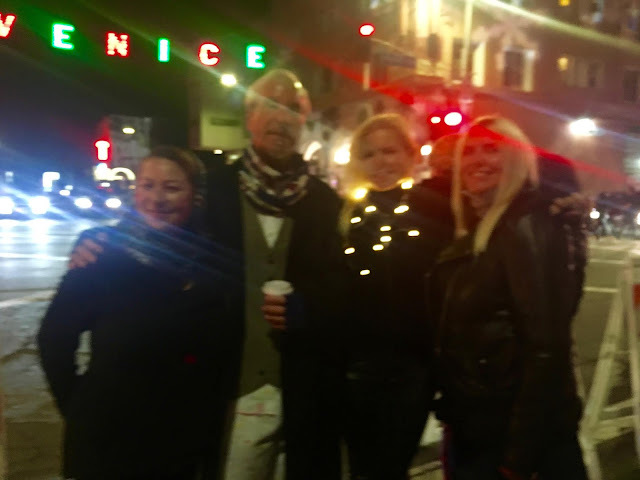 We had a full agenda of holiday revelry on the books for Sunday, and raced downtown after sledding to see the wonderful Hansel And Gretel opera, which was a real treat. Getting our culture on meant that we were late getting back to Venice for the annual Venice Canals boat parade, but I was told that the actual flotilla was very sparse this year ... like five boats strong. The sidewalks were full of partiers out to see all the brightly lit bridges and homes, but the actual parade participants were few. 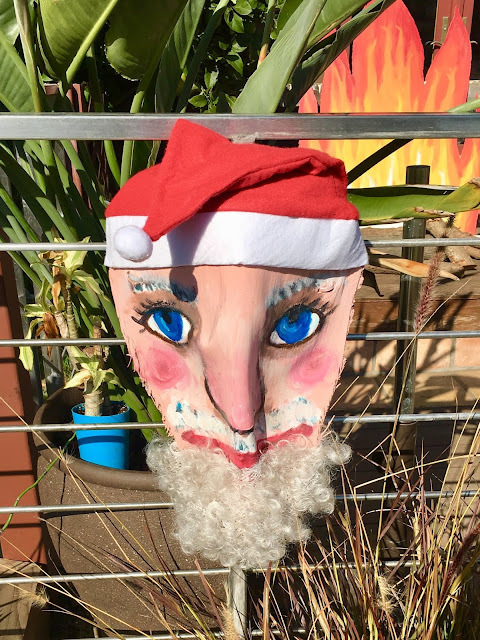 This tells me that there is either a lack of holiday spirit, which would be sad, or that many of the canal homes are being rented out for Air BNB, and no real members of the community really live in them, so the renters don't know to participate. 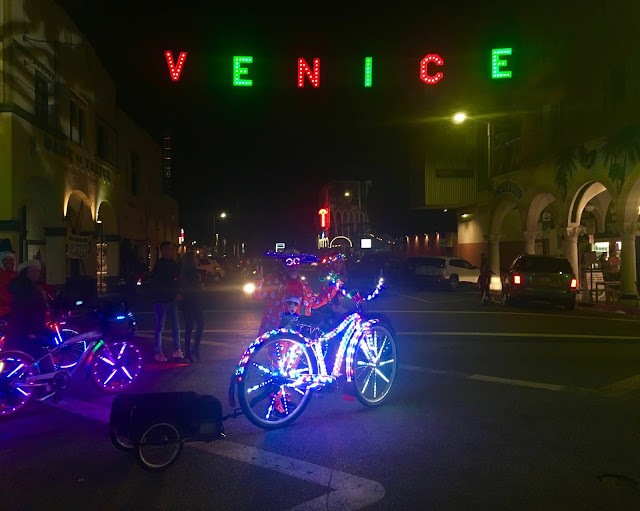 That is a real bummer, especially for such a wonderful, special part of Venice that this annual parade always is. The bridges were fantastic this year, maybe making up for the lack of nautical fun. There was the great VeNICE one, and the Eiffel Tower bridge was also very impressive (I like to think it's to show our solidarity with Paris, and also climate change awareness, but they might just like Paris). 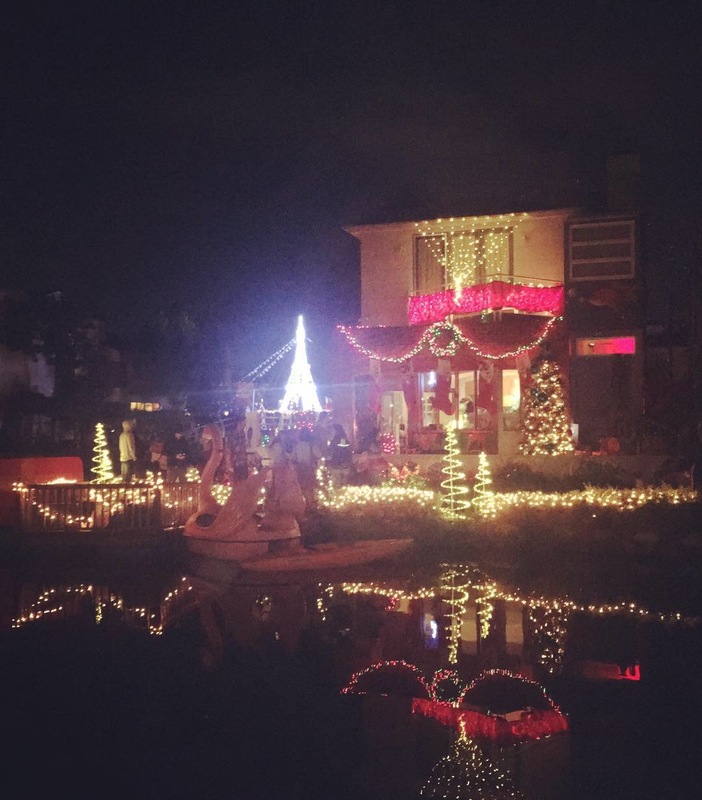 Many homes were brightly lit and hosting parties, with both the lights and the sounds reflecting off of the surrounding waters. 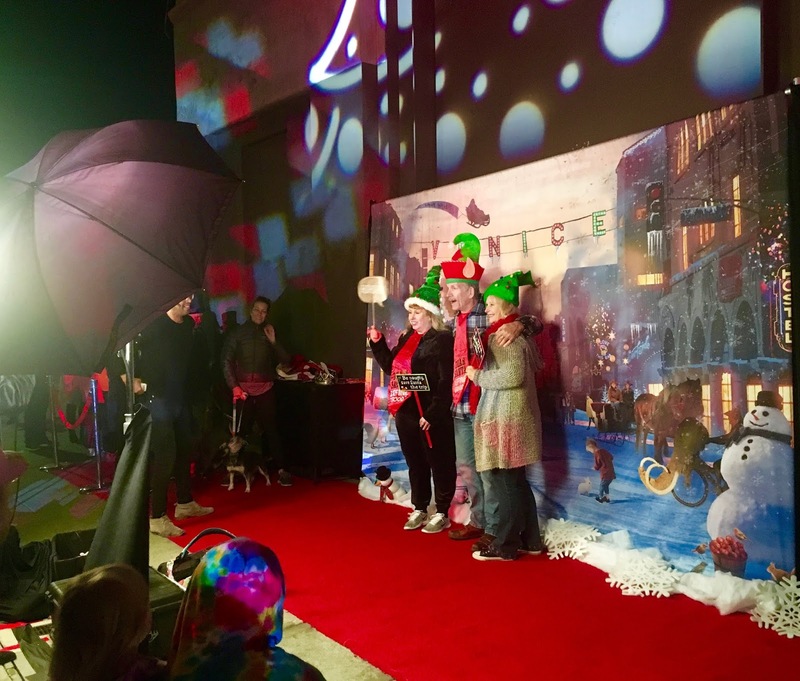 People seemed to shut it down extra early this year, which was kind of a buzzkill, but it was nice just to walk the sidewalks and see all the bright decorations. If (WHEN!) I live in the canals one day, you better believe this annual event will be made to be beyond memorable. The dark houses on this special day were sad ... and should be lived in by people that get it, and super appreciate the unique and fun place that they live. I'm working on it. Time is flying and Christmas will be here before we know it, with everyone scattering to places all over the globe. It's great to have these little unique to Venice holiday memories to take with us and share with the world. I love it. 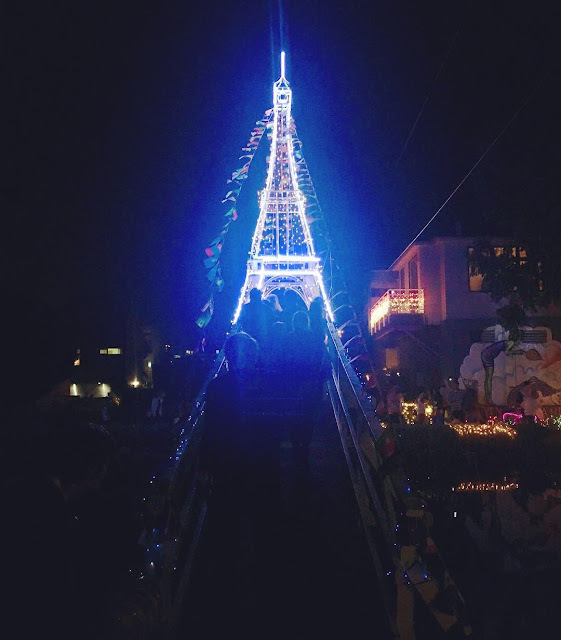 I hope everyone got to go, and if you didn't, you should just take a walk through the canals on any night this holiday season. Your own reflections will join those of the lights, and you will feel the holiday spirit rise up inside of you, no matter how you are feeling. It can't help but cheer you up ... and to that, I say CHEERS!